This meant Dr Diane Heath and I met up with our great team of helpers (post-doctoral, postgraduate and undergraduate students) in the Touchdown café on Wednesday to talk through what will be happening and the various roles they can undertake as a ‘Welcome Team’ member. They are all very enthusiastic and Diane and I have a great blend of experience and first-timers among the team members. 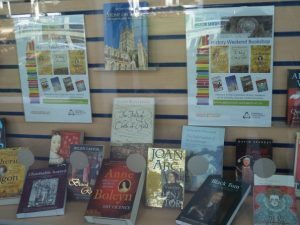 Another person gearing up for the Weekend is Craig at the CCCU Bookshop. 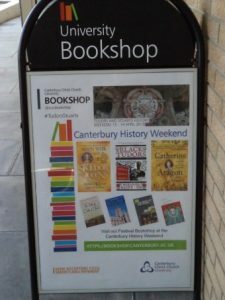 As in the past his team of Colette and Clive are also heavily involved and among the books available at the Old Sessions book stall will be pre-publication copies of Alison Weir’s new book on Henry VIII’s fourth wife Anna of Kleve. Alison will be delighted to sign newly purchased copies on Saturday at lunch time after her talk. 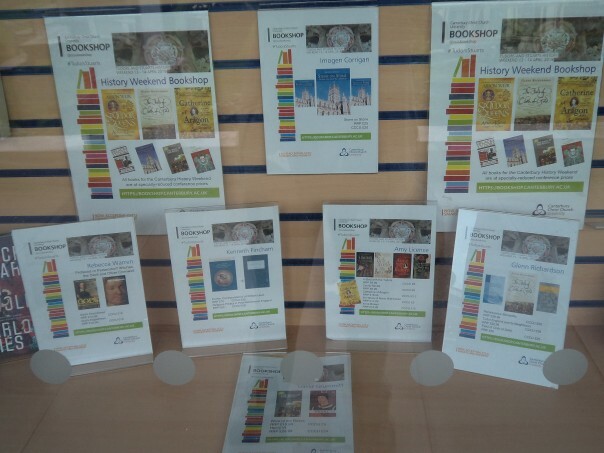 As you can see, Craig and his team have produced a lovely book display in the bookshop window on campus and copies of these books, too, will be at the bookstall. 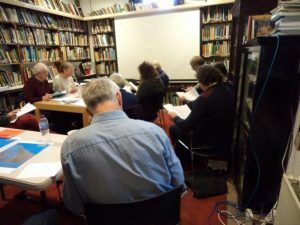 For the rest of this blog, I thought I would mention a Canterbury Archaeological Trust one-day course that took place yesterday in the Trust’s library at Broad Street. This is something the Centre contributes to occasionally because the vast majority of the courses are archaeological workshops on a wide range of topics. They draw people from across the country and are overseen by Dr Andrew Richardson and Annie Partridge, who together organise the Trust’s educational and outreach activities. For example, they are both involved in the ‘Finding Eanswythe’ project with Drs Lesley Hardy and Ellie Williams (CCCU) and volunteers from Folkestone. Back to yesterday and this year I and the thirteen participants met up to look at how historians use primary sources to explore the history of a town, in this case the Kentish head ports of the Cinque Ports of Sandwich, Dover, Hythe and Romney. What is great about such courses is that it brings together people with a wide range of experience and knowledge which they are happy to feed into the various discussions. Consequently, there were times during the day when you could have heard the proverbial pin drop as people studied the different sources individually before discussing them in small groups and then working through them together as a whole cohort when the roomed buzzed with comments, ideas, questions and suggestions. As a result, everyone was fully engaged which meant the tea/coffee and lunch breaks did happen but were shorter than I had intended in planning the day! During the ensuing discussions, as well as differences, including the presence/absence of town walls and other defensive structures, we found that there were certain similarities among the towns, such as multiple foci which had seemingly been largely driven by occupation: fishermen compared to merchants, for example, which also had implications for the location of religious houses including hospitals; parish churches, and markets amongst other features. 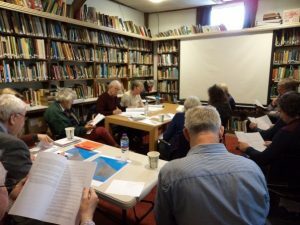 With these ideas in mind, and after a short break for refreshments, we turned our attention to ‘running the Ports’ and for this session I had drawn heavily on the various custumals, especially those of Sandwich and Dover. In part this was because Sandwich’s later 14th-century custumal references its 1301 predecessor and is thus one of the earliest, and because Dover’s exists as a 16th-century version in English and I wanted to provide a section of it to give people an idea of what the original looks like (for the latter I should like to thank Dr Justin Croft because he gave a copy of his transcription to me a long time ago when we were both studying for our doctorates at the University of Kent). Other primary sources on offer included entries from various civic accounts and among the topics we discussed in this session were the manner of civic elections; women and property; the care of orphans; market regulations; how and why men became freemen; civic-organised drama, and what was involved in maintaining town defences. Of course, these were not the only matters the various civic authorities were involved in, but we got a flavour of the range of activities and equally why certain aspects of local governance apparently mattered not only to the mayor/bailiff and jurats, but also to the commons. After the lunch break, we focused on piety, charity and parochial religion, including the fittings, furnishings and layout of the parish church. Again, these are very large topics so it was more an idea of getting some insights into what documents such as wills, churchwardens’ accounts and special parish collections can tell us about the spiritual lives of these medieval Portsmen. Like the Dover custumal, I had selected sources that were in English, albeit as some people discovered for the first time spelling and some sentence constructions can be quite challenging, but that only added to the day as people collectively sort to puzzle out what was being said. There was so much to discuss, and people were so interested that this session overran somewhat, which meant the refreshment break was very short before we embarked on the final session of the day. To round off the day, we explored occupations and households. I had provided a couple more wills, as well as part of the 1381 poll tax records for Romney, but because time was short and we had looked at wills already, I divided the cohort into two groups to investigate local tax records for 15th-century Hythe. These maletote records offer considerable insights into the working lives of the town’s households, as well as the allowances these householders could seek to reduce their tax bill. I have mentioned these sources before, and, even though they are difficult to work on due to the highly abbreviated Latin, they are excellent. I have used them myself for an article on the town’s butcher-graziers, especially the Honywode family (‘Hythe’s butcher-graziers: townsmen in the late medieval English countryside’, in C. Dyer et al., eds, Local History: New Directions since Hoskins, Hatfield, 2011), and will be using them again this summer for an article on the town’s fishing families for Maritime Kent through the Ages. For the purposes of the workshop, the groups looked at the records for 3 wards in 1419/20 and another 3 wards in 1447/8 to investigate the range of occupations seen across the different wards, the prevalence of multi-functional households, the numbers of widows heading households and their business activities, and the type of activities people did on the town’s behalf for which they claimed tax allowances. The participants found this fascinating, as well as noting the sophistication of the process, for as one person remarked in many ways there are strong parallels with modern individual tax returns. Indeed, the level of interest was so great that it was difficult to draw the day to a close at 4pm. Moreover, it was gratifying to learn that everyone had found the day extremely interesting, including one who commented that the best thing had been “The opportunity to investigate a wide range of different archival sources to build up a comprehensive picture of medieval town life”, while another felt it had been “A well-structured and interesting day which added to my knowledge”. 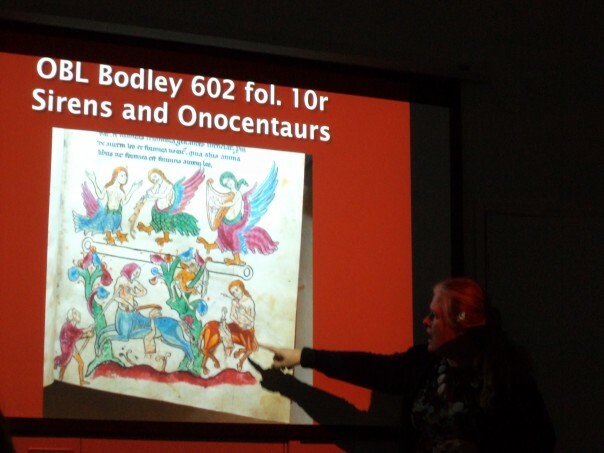 Someone else considered it had been a “Brilliant course – learnt a huge amount in a short time – very interesting and useful”, and I was especially pleased that someone had found that “Closer inspection of historic records to tease out the wider historical context” had been his/her favourite thing. So, all in all it had been a very successful day!